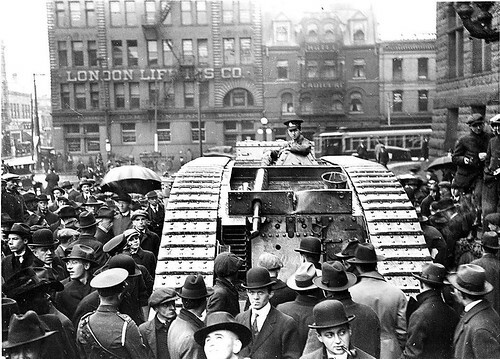 Earlier this week I started looking at old archived pictures from the City of Toronto Archives which showed how the city faired during the World Wars and I started thinking about what it must have been like to have lived there then. 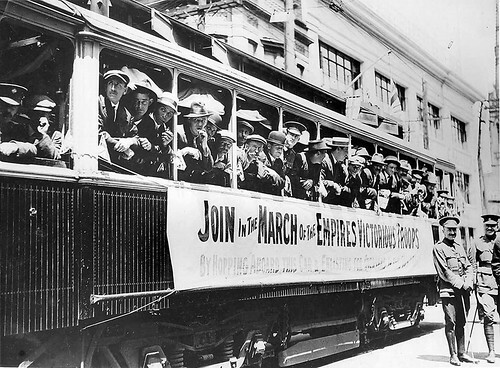 Today is a day to look back on what the generations before us had to endure during those trying times. This may be one North American city, but there were many across the continent who went through the same hardships and perseverance and I wanted to share these photos with all of you. 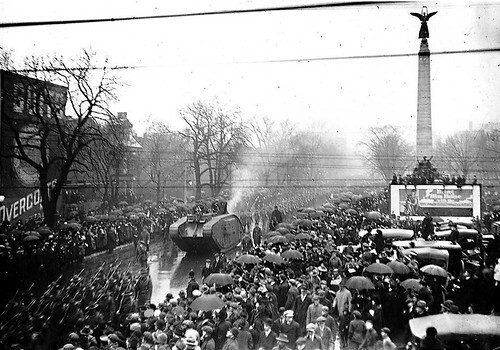 University Avenue, one of the major streets in Toronto, is shown here packed with people watching a Military Parade during World War I.
Streetcars used to recruit soldiers. 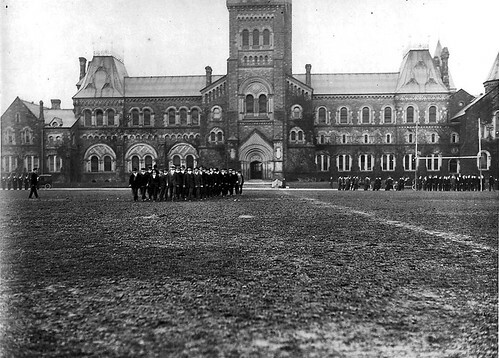 The University of Toronto campus, with students doing recruiting drills. The campus football field was also turned into a makeshift camp. 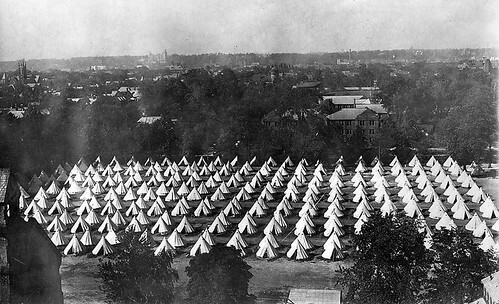 Rows upon rows of tents on the campus. 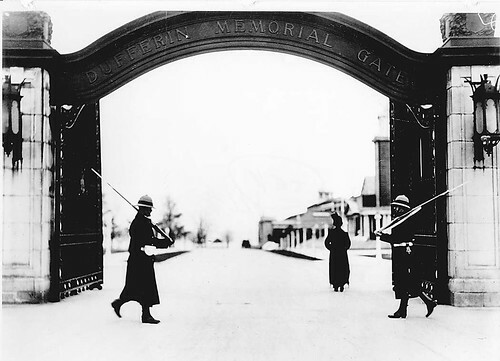 These are the gates of the CNE (Canadian National Exhibition Place), which I showed in modern times in my post earlier this summer when we went. 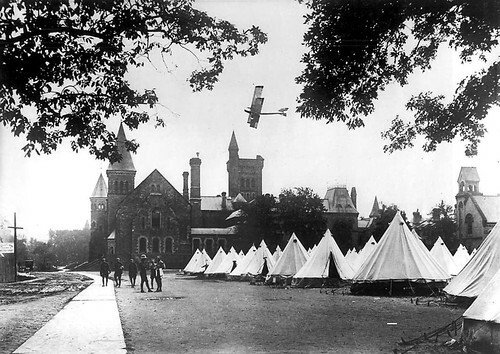 During World War I, the CNE ground were turned into a camp for soldiers. 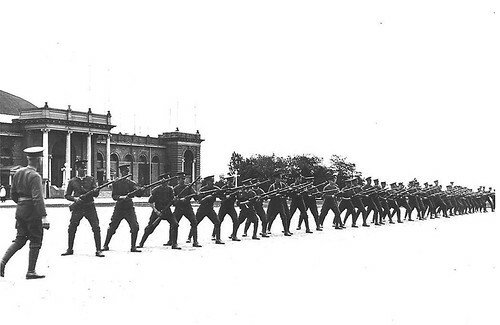 You can see the roller coaster for the midway in the background of this cavalry drill. 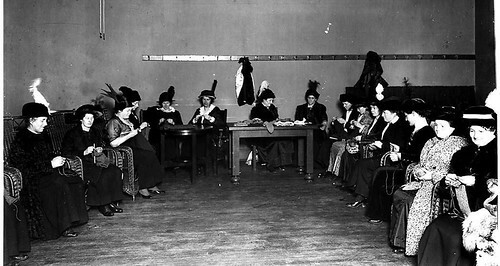 The Livestock Building (which you can see here in the Royal Agricultural Winter Fair) was used for testing out machine guns. 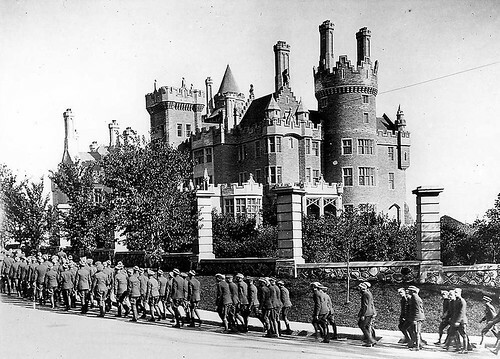 Even the area around Toronto’s famed Casa Loma was used for drills. 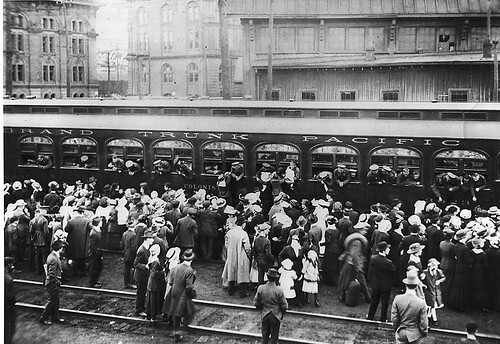 Union Station, which now sees 1000s of people coming in to work everyday from neighbouring areas, was where the soldiers were shipped out to the coast, for their long trip over to Europe. There pictures really got me teared up, seeing all the soldiers saying farewell. Some of these would have been final goodbyes. 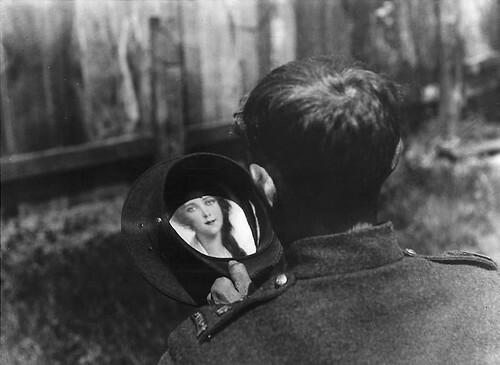 This photo of a soldier with a women’s picture in his hat is so touching. I hope he made it back home to her. 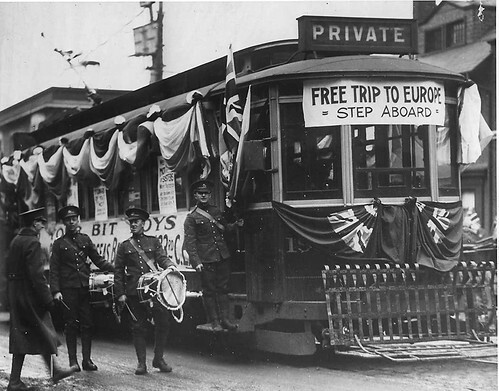 Even with the soldiers off at war, Toronto turned into a city of full of people working for the war effort. 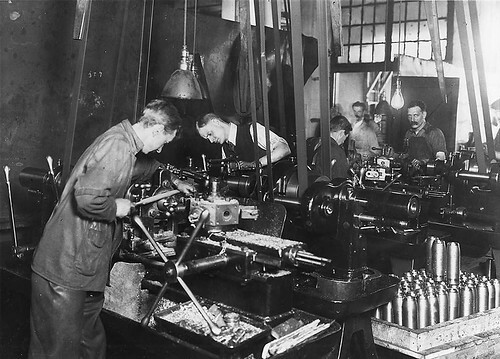 Machine shops quickly became ammunition manufacturers. 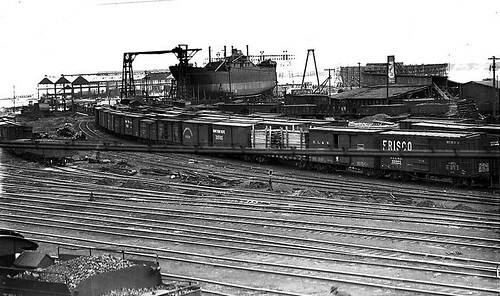 Liberty Village, now a popular nightlife area, was used to house ammunition. 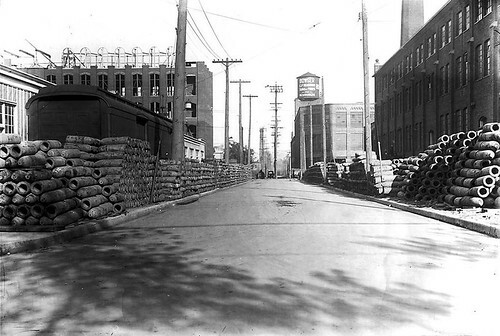 Gooderman’s Distillery in what is now the Distillery District, turned their booze making operation into a facility for acetone production for the military. You can see photos of it now from the Christmas Market I went to last year. 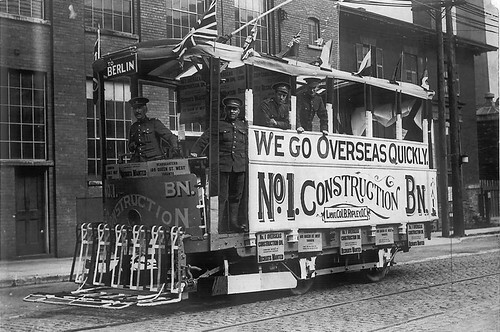 The Toronto Harbourfront is now home to many summer festivals, but back in war times, it was used for building ships. 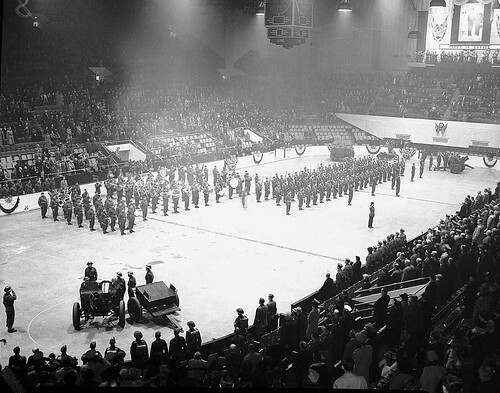 Throughout the city, military rallies became a norm, with the famous Maple Leaf Gardens hockey rink becoming home to many of these. 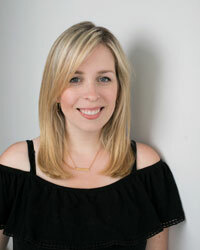 I love that in times of need, women rally together and do everything we can to help. 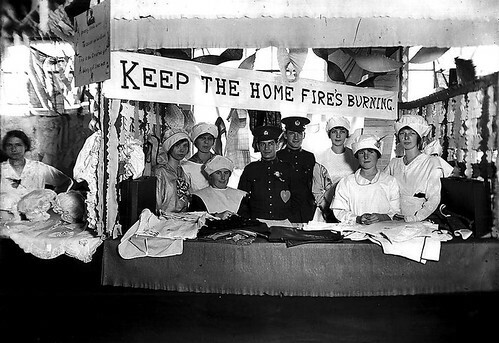 These ladies are holding a bazaar to fundraise for the troops. 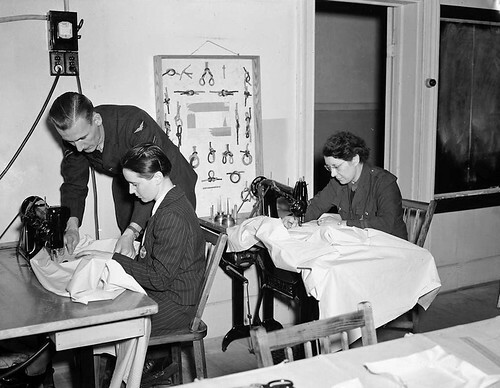 Knitting circles started making goods to keep the soldiers warm. 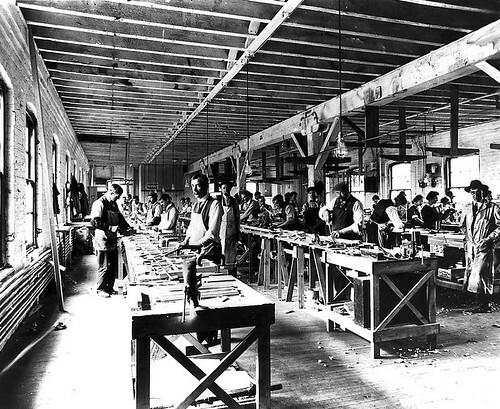 Those who could joined in on the manufacturing. How great are those goggles? 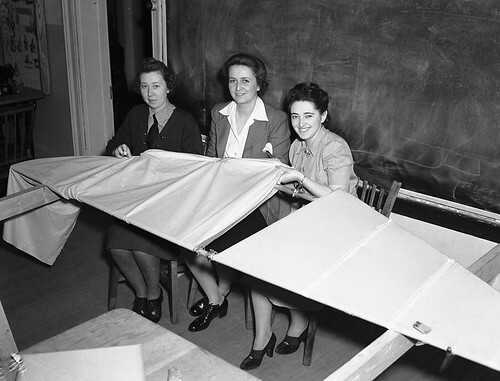 Seamstresses switch from dressmaking to parachute making. 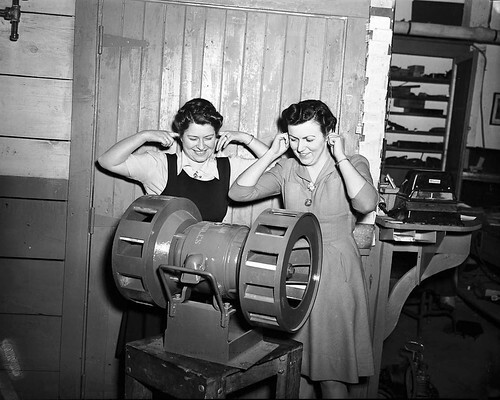 They even tested out air raid signals. 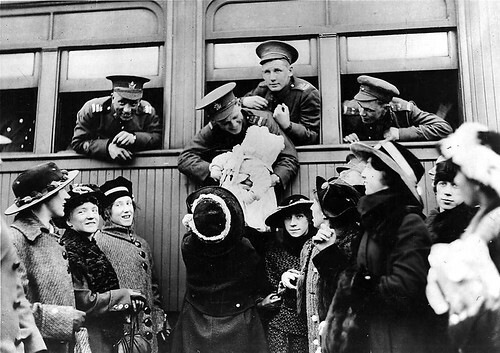 But even with all that positive energy, I think that this is one of the best pictures of the bunch – soldiers coming home. 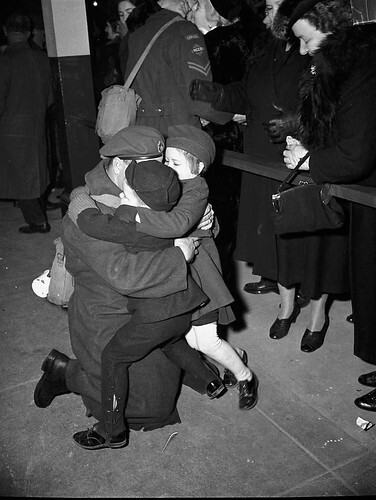 A soldier being welcomed home by his children. 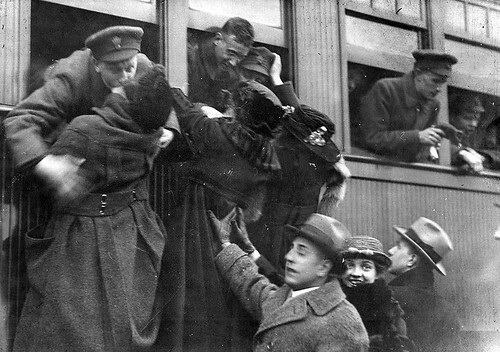 A wife meeting her husband at the train station. 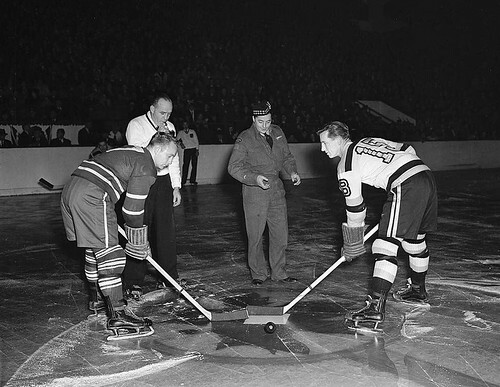 And in true Canadian fashion, a Victoria Cross recipient dropping the buck at a Maple Leaf hockey game. for everything that our country stands for. I really enjoyed your post and your photos. 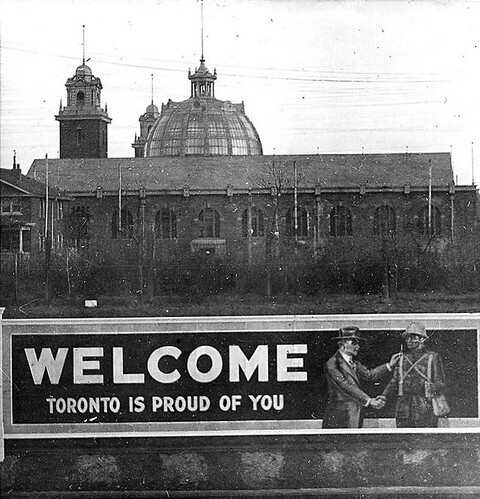 I have some wonderful pictures of my grandfather at the CNE parade grounds in 1916 and I really enjoyed seeing some other photos taken around the same time. 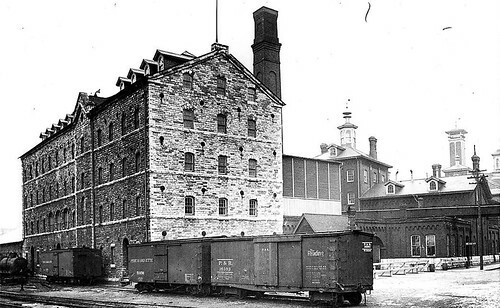 Also, the Distillery was called the Gooderham and Worts Distillery (Hiram Walker – Gooderham and Worts Ltd.). 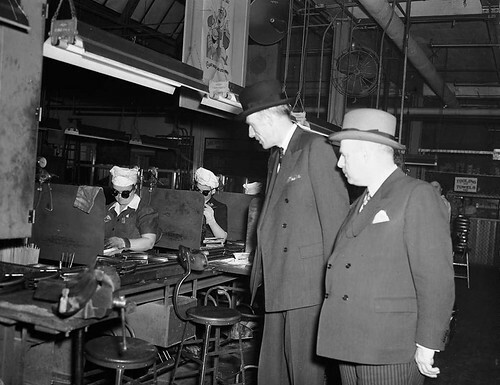 I was very interested in the photograph taken at the Livestock Building where the machine guns were tested in your segment Remembering a City at War – November 11, 2011. 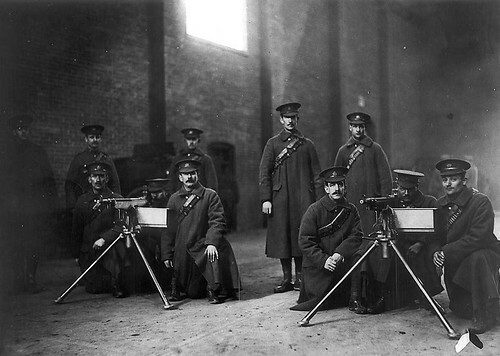 Would it be possible to identify the soldiers in the photo as well as the Battalion and the year it was taken. Thank you kindly.